We all know the story of the Emperor who gets a new set of clothes. In the story, nobody was brave enough to tell the emperor that his clothes were not, well, there. Finally, one little boy stood up and said what everyone else was thinking. Today I am that little boy. It happened this morning as it has uncountable times before. While perusing Facebook this morning I saw a picture of a woman who attempts to dress modestly. Her skirts are all long, her blouses have long enough sleeves. There was no plunging neckline. But I could tell immediately that she wears D cup bra because of the tightness of her shirt. I think a lot of it is ignorance. After all, there aren’t many people who will tell me “That really looks bad. You should wear something else”. But there are a few, and I use them. My husband will tell me. There are women (and even a few male family members) in my life who I can ask for an honest opinion about whether something is appropriate or not. Some of the problem is that we’re going through a stage in fashion where everything is tight. Some of the problem is people haven’t bought new clothes since they’ve gained weight. Some of the problem is that people are ignorant of the effect their clothing has on others. This problem is not just for women any more. Men’s clothing has recently take a turn toward tightness. Pants are skin-tight and shirts are sculpted. I’ve never had trouble buying clothes for my husband until recently. I know from personal experience how hard it is to shop for modest clothes. I know that larger people have it especially hard. As I have had 5 children and fought hypothyroidism my body has changed. Just when I think I have it figured out, it changes again. But it is possible to find clothes that fit well. It is possible to present ourselves in a manner that doesn’t draw attention to our bodies. If we pay attention to what we look like, how our clothes fit, and what they accentuate, we can dress modestly in an immodest world. Here are a few rules of thumb I personally use. If you find something that helps you, feel free to use it. 1. If it is so tight that it doesn’t “hang”, it’s too tight. If a shirt or skirt stretches out over a curvy part and then instead of hanging straight down it curves back in, it’s too tight. 2. Most scarves don’t cover; they accentuate. Unless they’re pinned securely in place and carefully used in a specific way, they give small glimpses of whatever is underneath as the scarf shifts around with movement. This peek-a-boo effect can actually be more attention-getting than if the scarf weren’t there at all. I wear scarves, but I don’t plan on them covering up anything. 3. Lace doesn’t count as cloth. 4. If I have to constantly tug on it to keep it in place, it’s either not cut right for me or it’s the wrong size. 5. I am extra careful with stretchy material. It should hang, not cling. 5. If in doubt, I ask somebody. And I have given somebody, or even a few people, permission, no, an order, to tell me if something isn’t right. I am not judging. I think a lot, even most, of the problem is ignorance and frustration with the garment industry. 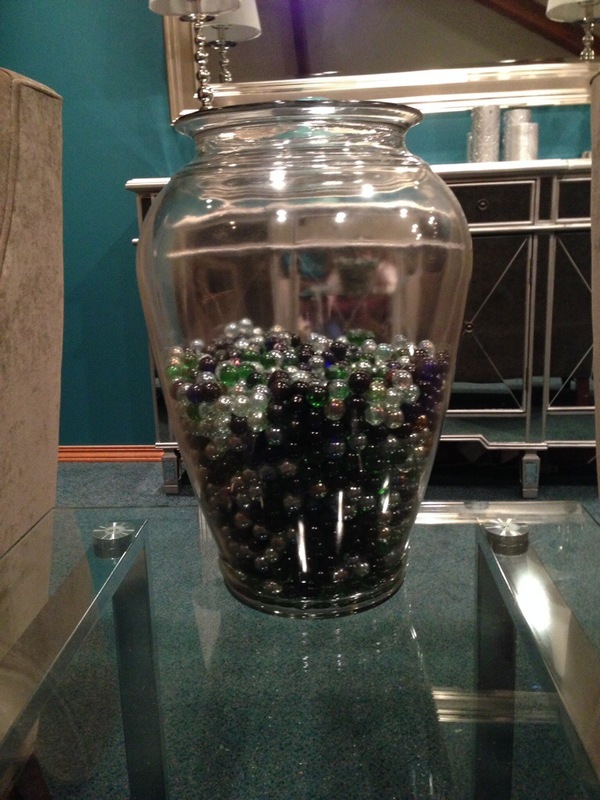 My husband has this jar of marbles in his office. About 15 years ago I put it together for him. Not only is it pretty and decorative, but it serves a purpose, too. You see, there is a marble in there for every week until he hits his 75th birthday. Every week he takes out a marble, holds it for a moment and thinks about how he “spent” the last week. Then he puts the marble somewhere else. When he hits 75 and runs out of marbles, (hopefully without losing his marbles, lol) he’ll begin putting one back each week and thinking about the blessing of an extra week and what he did with that blessed gift. The vase isn’t nearly as full as it used to be! It’s so easy to lose track of time and what we’re doing with it. It helps to regularly slow down, adjust our focus, and make any adjustments that are needed. This idea wasn’t original to us, and if someone else would like to use this idea, go right ahead! Besides, it’s quite pretty and would look nice in a home as well as an office.